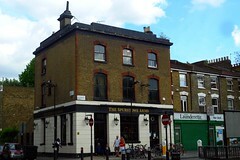 A pub near London Fields in Hackney. Note: According to Fancyapint (linked below), the Spurstowe Arms has had a refurbishment and change of management since our visit. There's no shortage of nice pubs around London Fields in Hackney these days, it seems. The Spurstowe is no exception, and has been refitted in the time-honoured style of bare-wood floors, carefully chosen antiques and brass fittings, and plenty of 'chill-out' music pumping out through the soundsystem. Appears to be owned by a small local chain. In point of fact, the music is the weakest part of this pub (though the manager notes they usually have northern soul and funk, so perhaps I just went at a bad time), but that leaves plenty of excellent features. The spacious beer garden has plenty of tables for sitting in summer (or smoking), and there's as much space inside as well. There's a menu on the chalkboard (mains range from £9-13), so it presumably changes fairly regularly; I didn't try the food so can't verify its quality (the olives [£2.50] were nice, though). On tap were Timothy Taylor, Ruddles County and Adnams Broadside, Addlestone's cider, and the now de rigueur Leffe and Hoegaarden alongside Staropramen, San Miguel and some other usual lagers. There's a wine list and even some cocktails listed (£5.50, with champagne cocktails at £6.50). My whisky sour was well-made and tasty, with a twist of lemon peel. Last visited by Ewan and Jo, November 2007. Prices verified at that visit. Last edited 2013-05-10 08:05:37 (version 13; diff). List all versions. Page last edited 2013-05-10 08:05:37 (version 13).